Our trip to New York was unforgettable. We took a red-eye flight and left for the airport right after Ryan’s choir concert on Sunday night. The musical event took place in a historic church in Los Angeles, home to the second largest pipe organ in the world, and known for its dramatic architecture and colorful stained-glass windows. The harmonies were lush, the songs were moving, and a portion of the after-show snacks were provided by none other than yours truly! The night before, in between packing our bags, we somehow found time to make over two hundred triple chocolate fudge brownies (our most-requested recipe!) and one hundred fifty 3-ingredient peanut butter cookies (replacing the caramelized banana with sprinkle of flaky sea salt), and the multiple trays of baked goods barely fit in the car with all our luggage. Despite wearing eye masks, earplugs, and blankets, we barely slept on the plane, but had to be energized and focused for the important meetings we had scheduled early Monday afternoon. Thankfully, the gorgeous east coast weather and pleasant Fall breezes erased any signs of drowsiness and guided us comfortably through the bustling city. Our home for the week was the one-month-old William Vale Hotel in Brooklyn, where the Saveur blog awards were being held. On Monday night, the Saveur staff threw a welcoming cocktail hour for all the nominees where we met a roomful of creative and friendly people, and bonded over sparkling wine and tasty hors d’oeuvres. Tuesday was the day of the awards. The nominees gathered for a buffet breakfast at the hotel, then split into groups to participate in a variety of culinary activities. We selected the pasta-making workshop, where we learned classic Italian techniques that we can’t wait to share with you. We made fresh hand-rolled cavatelli and listened carefully as Chef Tim Cushman of Covina shared tips on how he makes some of his renowned sauces. This informative class was followed by a delicious lunch—including a 4-course wine tasting—at the newly-remodeled Saveur test kitchen, and it was so interesting to see where all the behind-the-scenes magic happens. As the sun was setting, we gathered for the awards at the rooftop bar of the William Vale, where we were surrounded by glittering 360º views of New York City. The location was breathtaking, the appetizers and drinks were light and elegant, and the best part was spending time with our fellow nominees. We did not win the award for Best How-To Blog that evening, but more importantly, we won the friendship of talented bloggers from all over the world. It was truly an honor that our 18-month old blog was a finalist in this year’s awards, and we are inspired to work even harder so we can attend the ceremonies again next year! Wednesday was another full day. After a quick subway ride, we met with Deb Perelman for an early-morning coffee. We were excited to meet her in person since we have been making recipes from Smitten Kitchen for almost ten years. At noon there was a blogger meetup at the Union Square Farmer’s Market arranged by Christine from Yommme. It was a treat to finally meet so many friendly faces in person after getting to know them virtually online over the past year and a half. 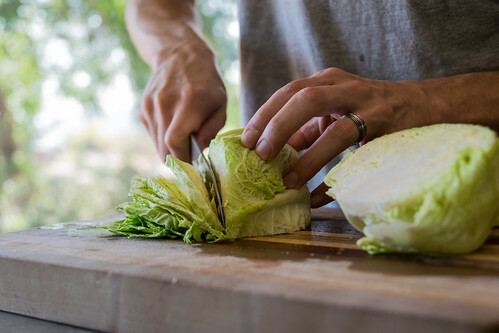 After strolling through the beautiful selection of seasonal produce and picking out colorful ingredients, a few of us headed to our friend Jill’s home where we made a creamy delicata and honeynut squash soup together, along with a crisp rainbow salad and fresh-baked sourdough bread still warm from the oven. On Thursday we had a few business meetings (more on that later), and in the evening our friend Mississippi Vegan had us over to his charming Brooklyn apartment for an authentic Southern-style home-cooked dinner. The stunning vegan creations that the talented Timothy Pakron posts daily on Instagram are mesmerizing. We have been drooling over his food photos for the past year and couldn’t believe that we were actually getting to try them in person! It felt like a dream when he offered us his signature shiitake bacon that we have been admiring for so long now. We hit it off from the moment we met, and it felt like we’ve known each other for years. The main course was a mouthwatering gumbo—a perfectly spicy dish that Timothy grew up enjoying in Mississippi. It was better than anything we could have imagined: warm, hearty, and delicious. 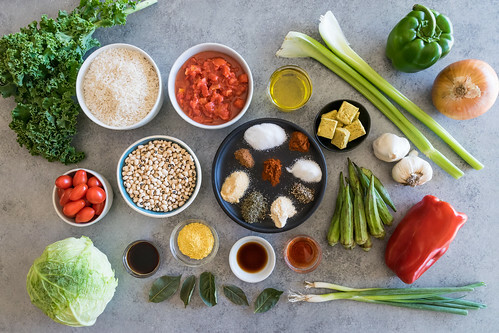 Luckily for us and the rest of the world, our gifted friend just launched his website where he shares his southern secrets, taking dishes that traditionally use meat and turning them into incredibly tasty vegan options. 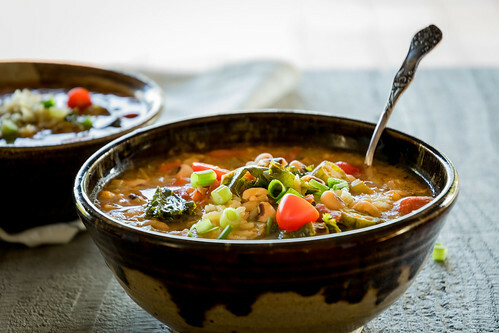 His gumbo won our hearts and we couldn’t wait to get back home and start making everything from his website. 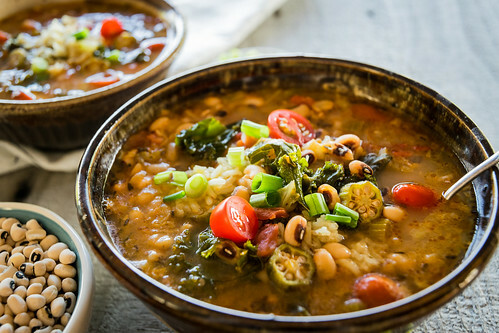 We knew that no matter what we picked first we couldn’t go wrong, but we started with a twist on a southern favorite—hoppin’ john with okra and tomato stew—and just like his exceptional gumbo, this hot and spicy stew is an instant classic. Despite how spectacular the flavors are, this recipe is actually easy to make. There may be a long list of ingredients, but besides the rice, everything is simply cooked together in one large pot. Oh, and one helpful piece of advice: if you are trying to avoid your neighbors, you may not want to make this at home since the robust aromas are guaranteed to draw everyone to your door. 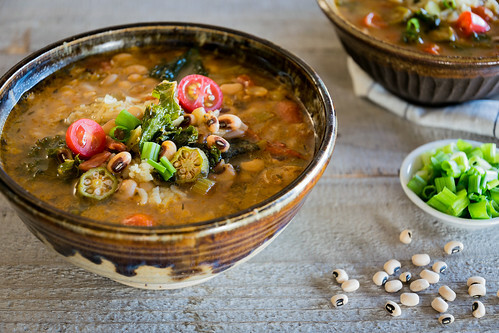 But it’s totally understandable: here, tender black-eyed peas are simmered with sautéed onions, mounds of garlic, crisp celery and bell peppers, and stirred with diced tomatoes, sliced cabbage and nine potent herbs like thyme, bay leaves, smoked paprika and cayenne pepper. Topped with toasted rice, shredded kale, halved cherry tomatoes, green onions, and thinly sliced okra, these colorful garnishes also add a satisfying texture and a pop of bright color. 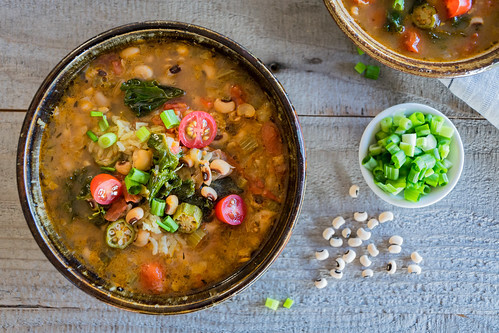 We have officially discovered our new cool-weather comfort food, and this stew is going to keep us warm and cozy all winter long. 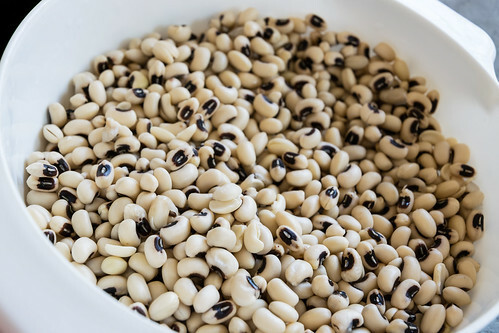 Rinse the black-eyed peas, and place them in a large bowl. Add enough water to cover the peas by several inches. Cover the bowl and let soak overnight, or at least 6 hours. Drain, then rinse the peas again, and set aside. Place an 8-quart pot over medium heat, and add 1/4 cup of the olive oil. 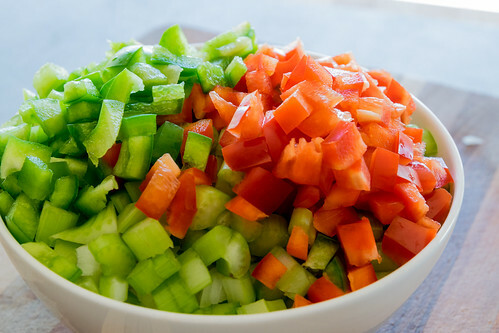 When hot, add the diced onion, celery, and red and green peppers, and sauté until beginning to soften, 5 to 7 minutes. 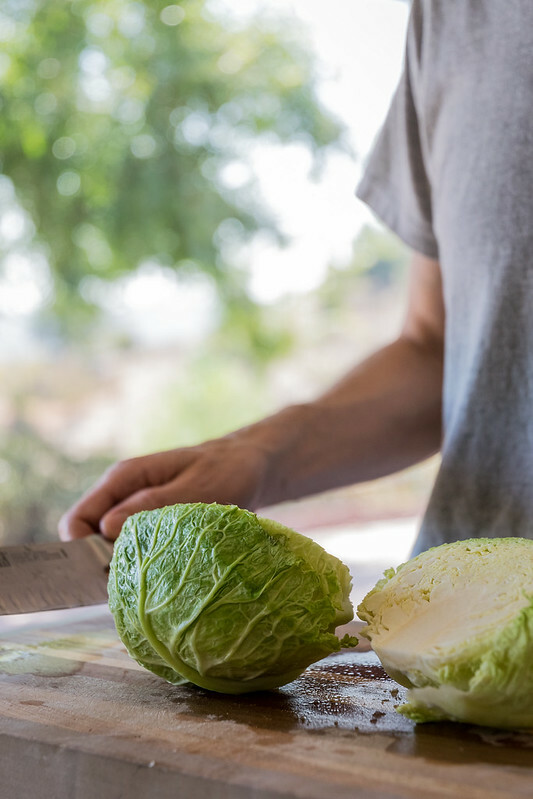 Add the garlic and cabbage, and cook until the cabbage softens, another 5 to 7 minutes. 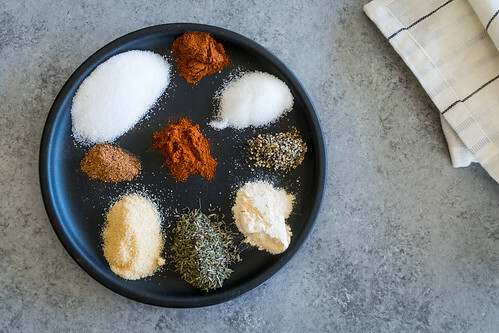 One at a time, add the seasonings to the pot, stirring between each addition: thyme, onion powder, garlic powder, paprika, nutmeg, cayenne, sugar, salt, pepper, nutritional yeast, red wine vinegar, tamari, and liquid smoke. Add the remaining 1/4 cup of olive oil, stir to combine, and cook for 5 minutes. Add the vegetable broth, cherry and canned tomatoes, and bay leaves. Add the soaked black-eyed peas, and stir well to combine. Bring to a boil, then reduce heat and simmer uncovered for 60 minutes, stirring occasionally. 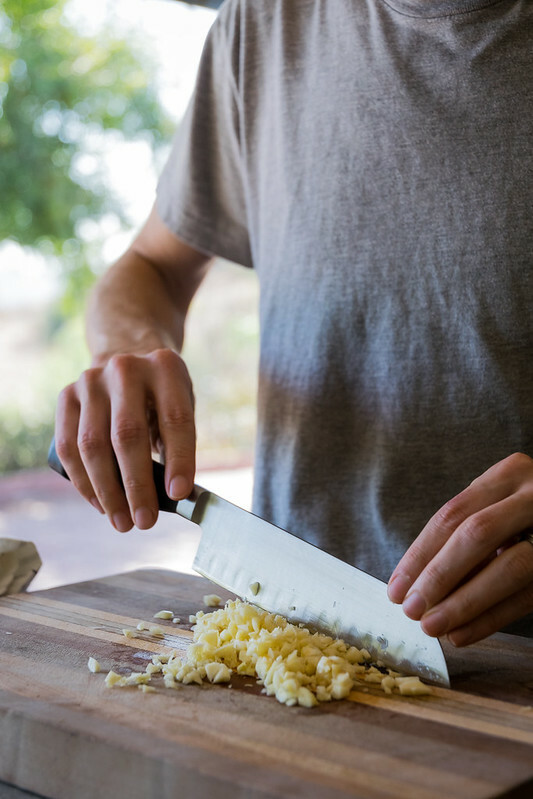 While the soup is simmering, make the rice. 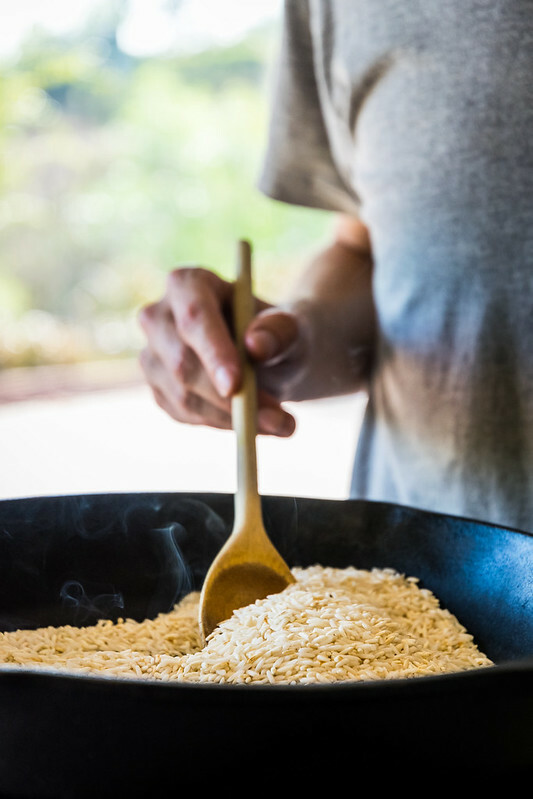 Place the uncooked rice in a dry skillet, and cook over medium heat until the rice smells toasted and begins to take on a slight golden color, 5 to 6 minutes, then transfer to a heatproof bowl to stop it from getting burned. Pour the water into a medium pot. Add the salt, bay leaves, olive oil, turmeric, and cayenne, and bring to a boil. When boiling, add the toasted rice, stir to combine, then cover pan and turn stove to the lowest possible setting. Cook for 15 minutes, until water is absorbed and rice is soft. Fluff with a fork. After the stew has simmered for 60 minutes, taste for salt and add more as needed, 1 to 2 teaspoons. 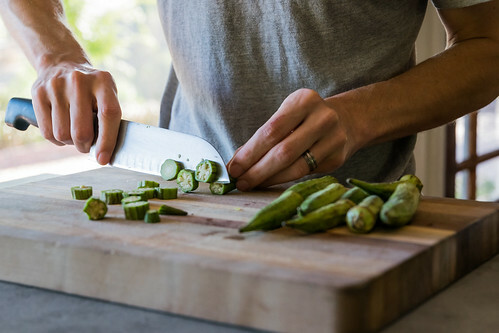 When you’re almost ready to serve, add the sliced okra and shredded greens. Stir to combine, then cover and cook for 5 minutes. 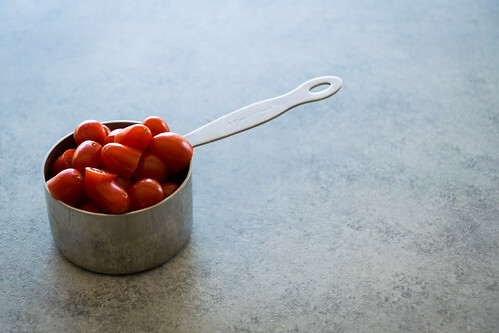 To serve, ladle stew into a bowl, top with a few scoops of rice, sliced green onions, cherry tomatoes, and a pinch of flaky sea salt, then serve hot, and enjoy! — The stew can be made ahead of time, and the flavors get even better the next day. If making it ahead, do not add the okra and greens. 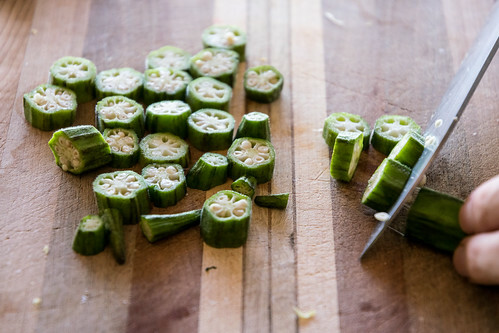 When ready to serve, bring the soup back to a simmer, then add the okra and greens and cook, covered, for 5 minutes. — Forget to soak the beans overnight? You can quickly soften the peas by placing them in a large pot, and covering with a few inches of water. Bring to a boil, cook for one minute, then turn off the heat and let the beans soak for 1 hour. Drain, rinse, and proceed with the recipe as directed.